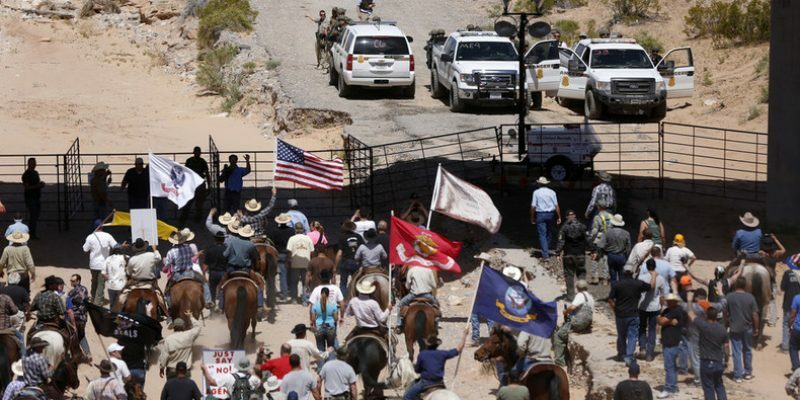 The confrontation spawned from a long-term dispute stretching back to 1993 between rancher Cliven Bundy and the BLM over grazing rights. Mr. Bundy was instructed not to allow his cattle to graze on federal-owned property bordering his land and was ordered to pay “grazing fees” in excess of $1 million. After ignoring their demands and two court judgements, the BLM took the aggressive action of herding up his cattle and causing a near-deadly altercation. On March 27, 2014, nearly 150,000 acres of land were temporarily closed off for the “capture, impound and removal of trespass cattle”. Ironically, estimates put the cost of the operation to the government greater than the amount in overdue balance owed by Cliven Bundy. It wasn’t just Cliven who was absolutely irate, it was also his sons Ryan, Ammond, Dave and thousands of sympathizers across the midwest who had grown tired of the BLM’s tactics. 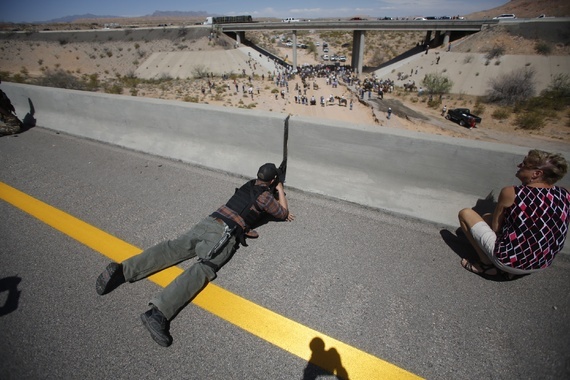 Within 48 hours, hundreds of these sympathizers turned into armed protesters gathering at the Bundy Ranch. The scene was set for a full-blown rebellion. Following the cattle-napping, several hundred protesters, many who were armed approached the operation at a gated highway underpass. It was a frightening sight for those on the ground and those watching via live-stream including myself. Federal agents took cover behind their vehicles, some of them with rifles aimed toward rural protesters. Some protesters took up sniping positions on the overpass, aiming toward federal agents while most of them stood in no-mans-land, handgun on hip. It was essentially a Boston Massacre scenario where any of the hundreds in attendance, on either side, could’ve sparked a blood-bath. Video can be seen below of Ryan Bundy negotiating with a federal agent in full military clad. The BLM relents and slowly reverses their vehicles as their agents walk backwards as to not turn their back to the armed crowd. Ryan Bundy cuts a sign placed by the BLM on the gate to cheers from the crowd before showing his brother Ammond standing on a sort of stage, cowboy hat in the air before shouting “The West has been won!” to loud cheers from the victorious crowd. The events that followed are worth reading up on which included the armed acquisition of a local wildlife refuge by the emboldened Bundy brothers, their subsequent arrest along with their father and the FBI shooting one of their close friends. On their way to speak to Clark County Sheriff Doug Gillespie, the FBI pulled over the Bundy vehicle but after several minutes, it continues down the road before coming to a road block and veering off the road, crashing into a snowbank. The incident that followed has been the subject of debate as to whether or not federal agents unnecessarily fired upon the vehicle and killed one of the passengers who was a close friend of the family, LaVoy Finnicum. He exited the vehicle likely upset by the shots allegedly fired through the windshield and with, what appears to be, his hands in the air. Federal agents approach with guns drawn as Mr. Finnicum falls forward into the snow. This certainly became the greatest tragedy of the day. 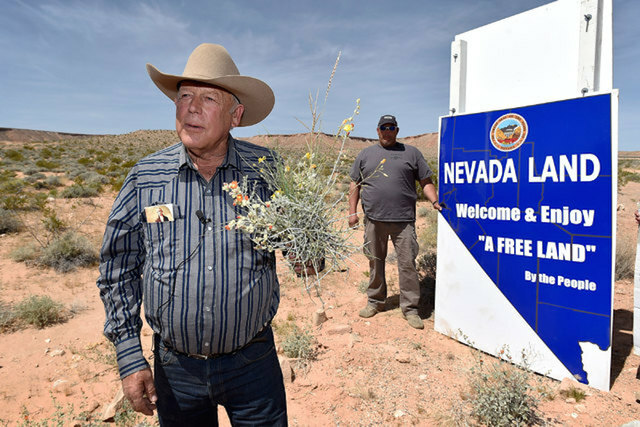 On December 21, 2017, a mistrial was declared in the trial of Cliven Bundy. 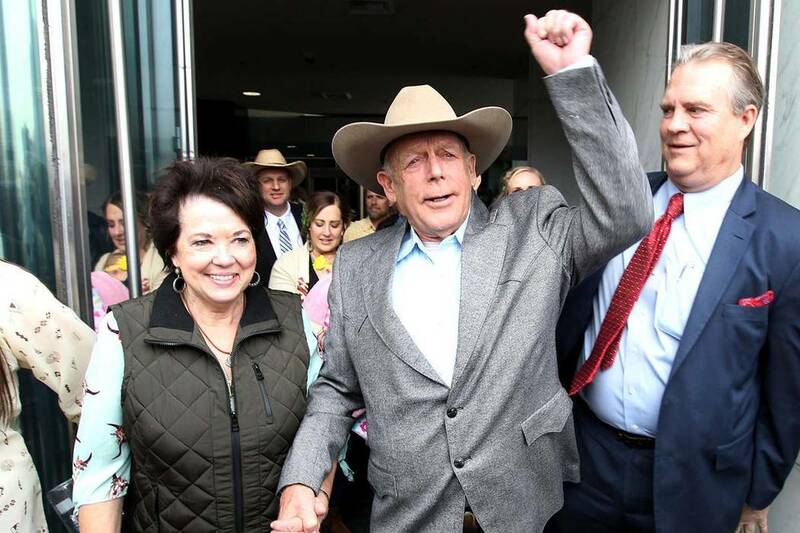 On January 8, 2018, judge Gloria M. Navarro dismissed with prejudice all charges against Cliven Bundy and his sons, strongly criticizing prosecutors for violations of the defendants’ civil rights, including failing to properly turn over evidence to the defense. The nation and our government should remember 4 years ago today as a dark moment where Americans nearly engaged in armed rebellion and a life was tragically taken. The incidents of the day seemed all too unnecessary over some cows, some grass and a stubborn old farmer. Let’s hope and pray to avoid similar situations in the future when it could not end so quietly. Next Article BAYHAM: Will Scalise Be Speaker?